The world’s foremost cargo sailing ship, the beautiful square-rigged Tres Hombres, is now sailing back to Europe from the Dominican Republic. Another successful round-trip voyage from The Netherlands to the Caribbean is coming to a close. The star example of zero-carbon shipping, the 32-meter brigantine Tres Hombres cargo sailing ship has made good progress across the Atlantic, and has left the Azores going northeast. Depending on weather, it will call at UK and then return to home port in Den Helder in a matter of days. Falmouth plans a celebration May 1-4 when the ship is to arrive. As of April 16, the Tres Hombres, three days out from the gorgeous Portuguese archipelago, was moving along at an average of nine knots which is good. Tres Hombres left the Dominican Republic on March 13, laden with rum, cacao beans, and wine taken on months before in Brittany for the aging effect on board. From “Hispañola,” in 24 days the ship reached the island of Faial, Azores. Four thousand cans of sustainably caught tuna were then taken on at Sao Jorge and found room in the cargo hold, satisfying some northern European demand. The ship’s remainder cargo tonnage is 22 barrels of rum (180 liters each), plus 108 bags of cacao beans at 70 kilos each, for a total of over 7 tons. Also, ten large barrels of molasses are on board, topped off with a whole pickup-truck of cacao butter. The Tres Hombres was loaded by hand over 3 days on Hispañola to reach a total of 30 tons of goods. 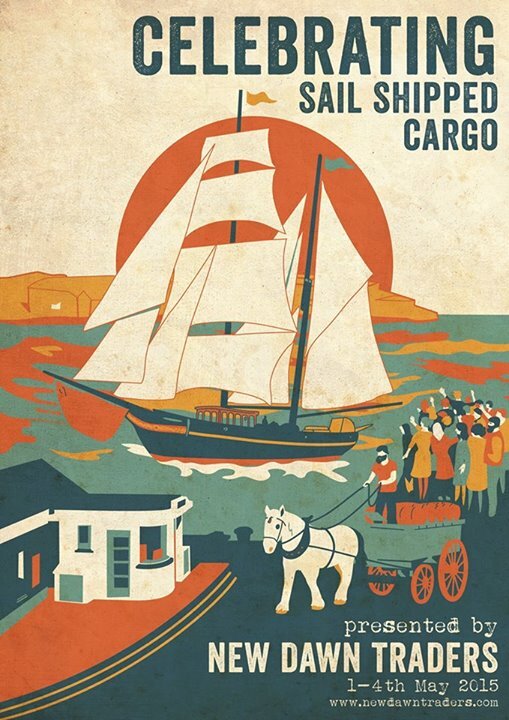 Sail Transport Network reported on December 3 of last year: Tres Hombres Sails across the Atlantic Again, with Some New Twists. In the six years’ voyages, variations have come into play. For the current voyage the tall ship left her home port of Den Helder on Oct. 9 and first sailed to Stavanger, Norway to pick up a load of salt fish. From there she sailed to Brixham, UK, where she took on ale, for French health-food store customers. DATE: 16-04-2015 Arquipelago Dos Açores! It has been one month since we left the Republica Dominica on the thirteenth with a new moon. After being twenty four days at sea with only waves and wind, sometimes dolphins or a whale, we saw an island appearing out of the ocean surface. Looking at her beauty we all agreed. Green is a nice colour! After staying six days on the beautiful island Faial and a short visit to Sao Jorge, we departed again with a new moon and again on the thirteenth of the month. This time with a scenery which filled all of us with awe. The volcanic islands, especially the top of Pico, rising out of the ocean like gods of fertility. Enormous monsters of beauty exploded from underneath the ocean floor, to meet the bright rays of sunlight from above… And when time passed by, they have become a real paradise of life. Everybody of the crew and trainees did enjoy our time on this natural treasure in the middle of the Atlantic Ocean. The people living here are friendly and helpful. There is a good interaction between the visitors and the local people. For our food supplies we went directly to the organic farmers. It is very nice to do shopping by walking on the land instead of being in the supermarket. With the farmers we talked about possible precious products which can be shipped from or to the islands by sailing ship. The soil on the Açores is very fertile and capable of producing abundant vegetation and crops. The islands could be able to produce their own food supplyWe brought also some other products in small amounts; Pico wine, Cha, Nêveda (green) Tea and Honey. ( It´s not only cows, but there are also an overwhelming amount of bees on the islands, and so flowers). As we reported in December, Fair Transport (whose first ship was the Tres Hombres) is now pursuing the construction of its biggest ship, a clipper, and intends to make a voyage of the renovated Nordlys ketch in 2016 to the Mediterranean, bringing salt fish. SAIL MED will be on hand. This reporter writes from Delft, The Netherlands, where the MARIN group in conjunction with the SAIL consortium is holding a seminar on wind power for shipping. 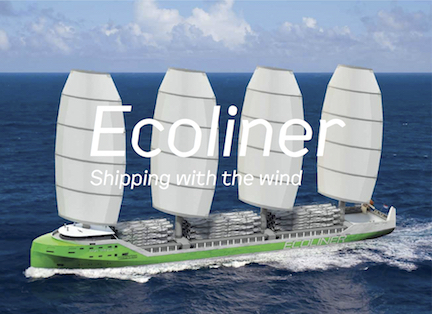 The Ecoliner, a high-tech cargo ship-design, is nearing its study-completion under a European Union grant. Participants will also get an update on the future of Hybrid Shipping. Mrs Netelenbos, former Minister of Transport, and now president of the Royal Association of Netherlands Ship owners, will open the SAIL conference. To attend this conference please send an email to info “at” nsrsail.eu. This SAIL conference is integrated in the BlueWeek 2015, from 20 to 22 April 2015. The BlueWeek is hosted by Deltares in Delft and co-organized by MARIN. It provides a platform to discuss sustainable energy in shipping and offshore. Pictured is the poster publicizing the arrival of Tres Hombres in Falmouth. New Dawn Traders are organizing a great event, welcoming the sailing cargo vessel Tres Hombres on her arrival in Falmouth on the 1st May. 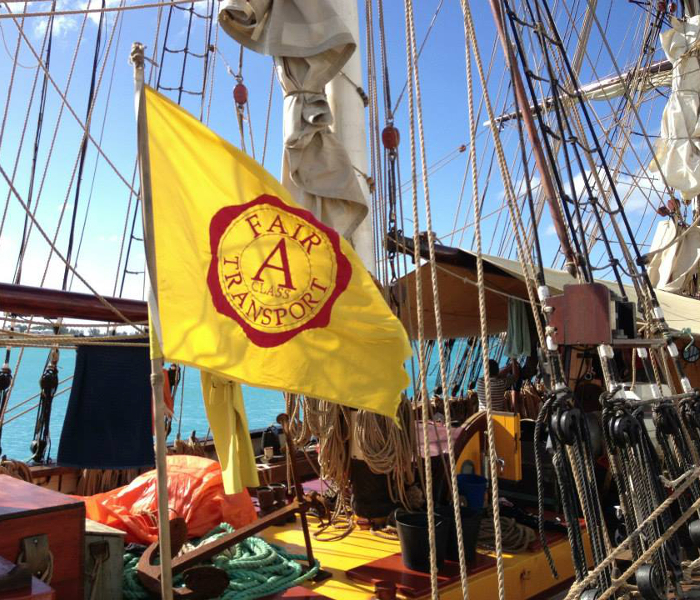 Follow sail transport news, developments, and commentary on the Sail Transport Network's Facebook page.